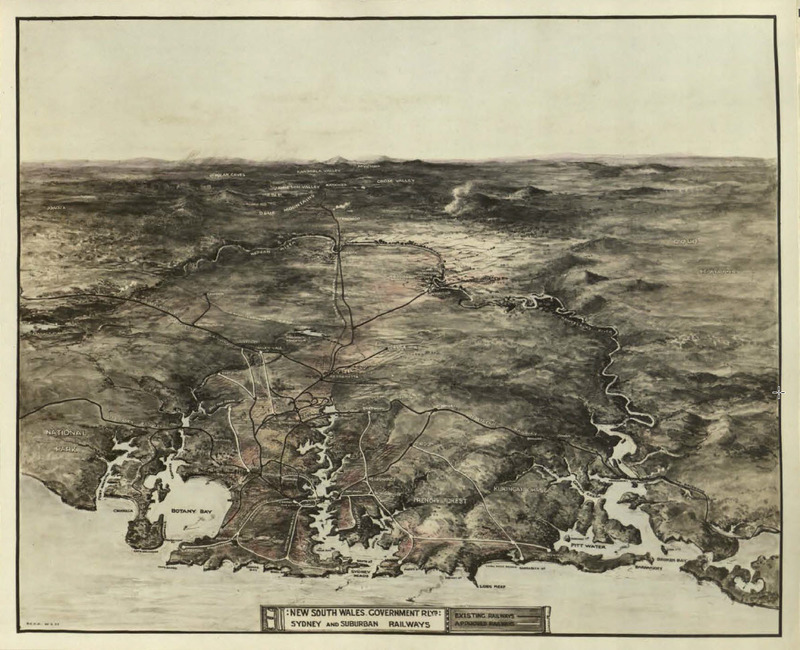 In 1921 Greater Sydney stopped at the northern beaches and Hornsby. 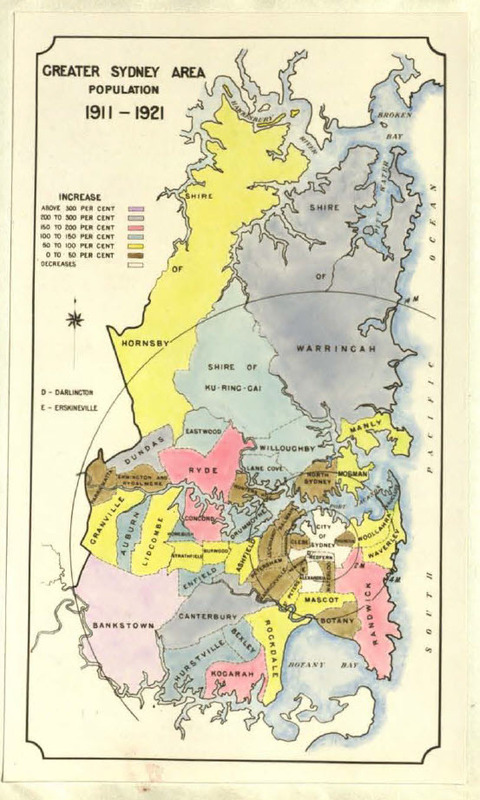 In the south, the city extended to Sutherland while in the west it reached only as far as Parramatta, which along with Bankstown and Granville were regarded as “outlying Suburbs”. The combined population of the “Districts outside the Greater Sydney Area”, which included Campbelltown, Baulkham Hills, Blacktown, Liverpool and Penrith was less than 52,000. The other major difference in Bradfield’s day was the rate of population growth. In just twenty years to 1921 Greater Sydney’s population had nearly doubled, to almost one million. Despite this Sydney had surprisingly few railways. There were no passenger lines in the CBD – the railway started at Central on its southern edge, dividing into branches several kilometres further out which then formed the major corridors to the city’s hinterland. Sydney’s suburban services – and, consequently, suburbia itself – developed mainly along these lines. Sydney relied on trams to a much greater extent than Melbourne, especially in the inner suburbs. A city increasing in population is a prosperous City, and given facilities to travel, the number of journeys per head of population increases much more rapidly than the increase in population, and it becomes more and more difficult to make the channels of passenger transport equal to the ever growing demand. In other countries where similar conditions have arisen, the solution, in recent years, has always been by rapid transit electric railways. In planning for a rapidly-growing city Bradfield was not to know that his assumptions that about continued population growth and increasing passenger patronage would turn out to be incorrect, nor that the Depression would occur and have such a devastating impact on government expenditure. Ultimately these factors and above all a third – the rise of private car ownership – meant that many of his proposals were never built. Which Bradfield plan – and was it Bradfield’s? It’s important to recognise two things – Bradfield wasn’t the first to propose many of the lines he subsequently incorporated in his plans, and he also amended his proposals many times in response to changing circumstances. Bradfield was appointed to oversee railway and tramway design in the Department of Public Works in 1906. In attempting to provide transport infrastructure for a fast-growing city, he faced three key issues – how to bring the railway into the city from Central Station, how to provide a connection across the harbour and where and how to expand the suburban rail network. As was noted in the previous article in this series, there was considerable debate over all these issues, resulting in dozens of proposals. Most prominent were the findings of the Royal Commissions on Communication between Sydney and North Sydney, and on the Improvement of the City of Sydney and its Suburbs, both established in 1908. At the time the latter commission was announced, the architect and planner John Sulman published a series of articles outlining his plans for the improvement of Sydney. He proposed a rail tunnel to cross the harbour and a “flattened loop” to be constructed in shallow tunnels for the city railway. Sulman also called for an “extended circular railway” to the east of the city and a similar loop in the west to Balmain and Leichhardt, though he was concerned that the bridge required between the Balmain peninsula and the city would “aesthetically undesirable”. Sulman’s ideas – which themselves incorporated several previous proposals – heavily influenced the outcomes of the Royal Commissions. Bradfield and his team worked on the recommendations, looking initially at harbour tunnel options. These were strongly opposed by the Railway Commissioners and to cut a very complex story short, Bradfield was asked to prepare a proposal for a bridge crossing. While doing so he also developed a modified city railway plan. He proposed a “high level scheme”, which took advantage of Sydney’s hilly topography to avoid steep grades by locating lines partly underground and partly in viaduct rather than deep underground. Bradfield acknowledged this would require additional property resumptions but argued would the costs would be offset by potential value capture resulting from the resale of unused land. Eventually, after much discussion and some modifications, his plans for the city railway and the first stages of the eastern and western rail loops, to Bondi and Rozelle respectively, were put to state parliament and legislated in 1915 (the Bridge Bill took a lot longer; first tabled in 1916, it did not pass until 1922). These plans were outlined in his 1916 report but Bradfield’s ideas continued to evolve, as demonstrated in the attached maps. There are differences between his initial proposals, those that were approved in legislation, those he outlined in his 1924 thesis and those that he subsequently advocated. 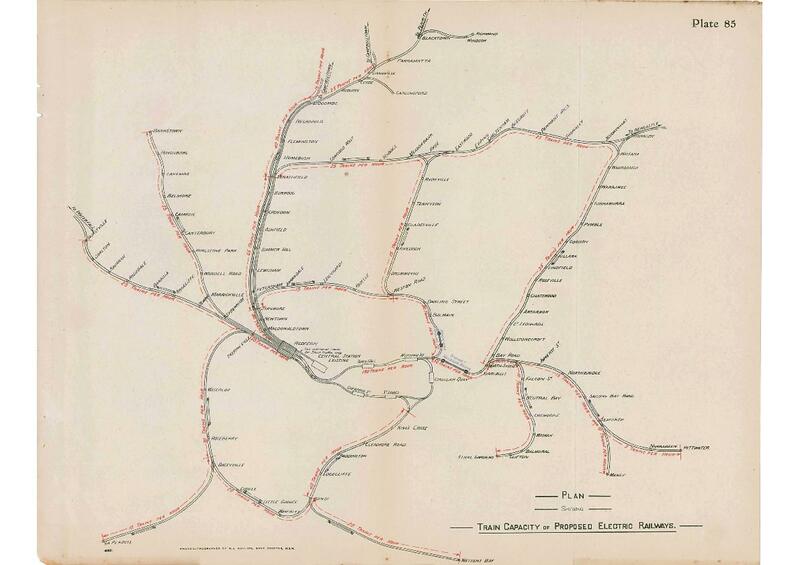 Bradfield’s changing City Railway Plans, 1913-1925. Source: R. Raxworthy (1989), The Unreasonable Man. Owing to its limited area further expansion in the City proper can only take place by increasing the height of the buildings. This is being done, but at the same time the suburbs adjacent to the City proper are being developed and arc gradually expanding and assuming characteristics of the City. These suburbs will be served by suburban railways, so that following what has happened in other cities, the rate of growth of traffic in the City proper will gradually decrease. Apart from the city railway and the harbour crossing, Bradfield’s rapid transit plans involved three key lines servicing these inner-city suburbs. Two of these echoed Sulman’s loop proposals; the first, and most elaborate, was an eastern suburbs loop. This involved a line leaving the City Circle near St James station and proceeding eastwards via Kings Cross, Paddington and Edgecliffe to Bondi (Bondi Junction) then south to Coogee and Dacyville. There it turned westwards, travelling through Roseberry and Waterloo to re-join the existing rail network near Erskineville. An early version also incorporated another line leaving the city circle between Central and Liverpool St (now Museum) to cater to the large numbers of people attending events at the Sydney Showground and Randwick Racecourse, before joining the larger loop near Coogee. This didn’t appear in Bradfield’s 1916 report, replaced instead by branches to Watsons Bay and La Perouse. The junction with the City Circle also changed, from north to south of St James Station. In Bradfield’s 1925 plan this line was extended through St James station via an additional CBD loop incorporating two further stations before interchanging again with the city circle at Town Hall station. The second line to the west was more straightforward on paper. Leaving the main western line at Petersham it travelled via Annandale, Leichhardt and Rozelle to Balmain. From there it faced a major hurdle – a water crossing between the Balmain peninsula and the city, the problem raised by Sulman years earlier. Initially Bradfield opted for a bridge starting not far from the southern approaches to the Harbour Bridge, but later proposed a tunnel in the same location. 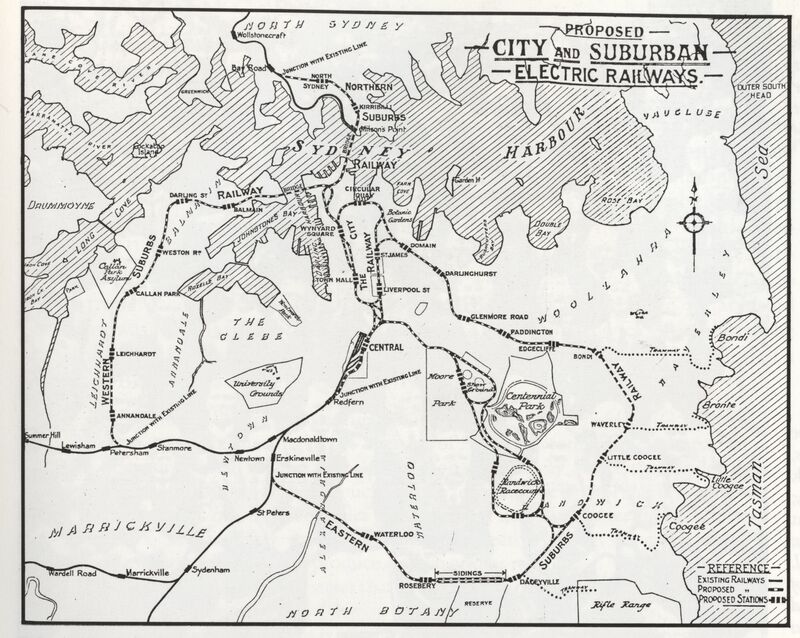 In the 1925 plan the western suburbs line entered the city further south, connecting directly with the eastern suburbs line at Town Hall. In constructing the City Circle Bradfield built two small but critical sections of the eastern and western lines to ensure they could be commenced later if money ran out. The first was the interchange tunnels and platforms at St James, while the other was extra platforms at Town Hall where the lines would have joined. As it turned out neither project was constructed during Bradfield’s lifetime. The western line was never built. Eventually the Eastern Suburbs Railway (ESR) opened in 1979, but only as far as Bondi Junction and on a somewhat different alignment to Bradfield’s. However, it does make use of the spare Town Hall platforms. The interchange infrastructure at St James remains unused to this day. 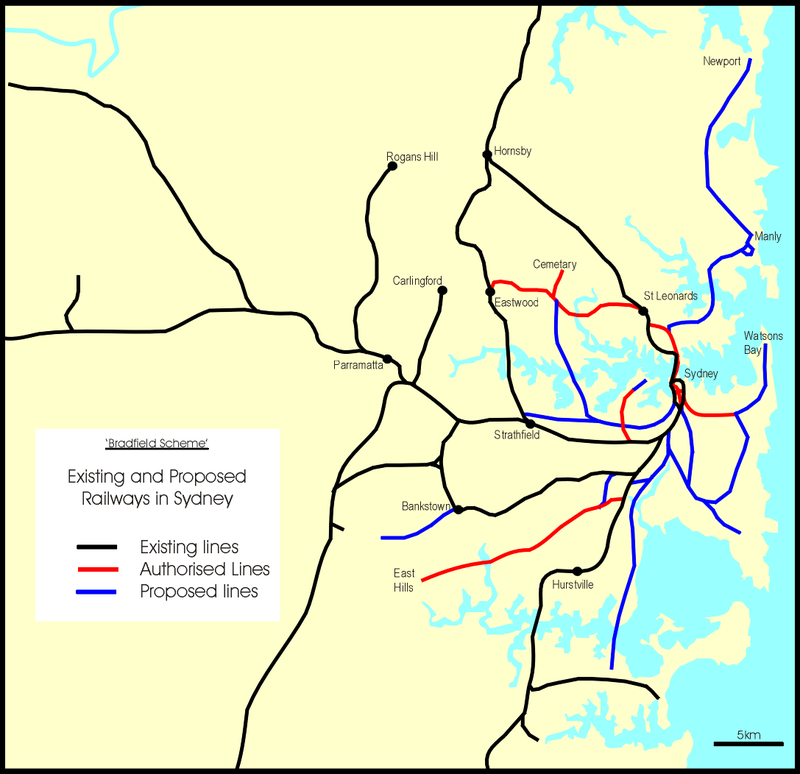 Bradfield’s third inner-city line proposal was the inner section of a line from Wynyard over the bridge to Manly and and the northern beaches. The southern section of this line plus the branch proposed to Mosman and Athol Gardens would have serviced Sydney’s inner north-eastern suburbs. Ironically, while this line was not included in the 1915 Bill, it had the most substantial section of any of Bradfield’s proposed inner suburban railways completed, in the form of the second set of tracks from Wynyard to North Sydney over the Harbour Bridge. However, without the extension to the northeast, this line was surplus to railway requirements and was used by trams from 1932 to 1958 before being converted to traffic lanes. In 1992 one of these lanes was turned into a bus lane. Although this post is mostly about Bradfield’s inner-city lines it’s worth having a quick look at his outer suburban proposals. While the northern beaches line didn’t extend past North Sydney and his proposal for a line to run from his planned western suburbs line to the Main North line near Ryde never commenced, Bradfield had more luck with some of the other lines shown in his plans. The East Hills line which Bradfield designed opened in 1931.The Sutherland to Cronulla route originally opened in 1908 as a steam tram line designed by Bradfield and was converted to a rail line and electrified, opening in 1939. Bradfield’s proposal for a line between St Leonards and Eastwood was actually endorsed in a 1927 act of parliament but never constructed. However, a similar connection opened further north, between Epping and Chatswood, in 2009. Later this year the line will close for seven months for conversion to form part of the Sydney Metro Northwest which will open in 2019. Part of the eastern suburbs finally did receive rapid transit with the ESR’s opening in 1979, although this is about one-third the length of Bradfield’s planned line and added only four new stations. The south-eastern suburbs also received additional rail infrastructure through the construction of the Airport Link which opened in 2000, adding five new stations (two at the airport). The eastern suburbs will gain additional rail-based infrastructure when a new light rail service to Randwick and Kingsford opens in 2020. However, this is more akin to the reinstatement of the tramlines removed in 1961 than it is to the provision of a metro service. The only additional rail service provided in the inner west is also light rail – the route from Central to Dulwich Hill which follows the old Metropolitan Goods Line. The city will finally gain a “proper” metro with the opening of the first stage of the Sydney Metro in 2019 and its extension through the CBD in 2024. The main technical similarities and differences between the metro and Bradfield’s mass transit plans were discussed in the previous post, but the biggest contrast will be in the route chosen. The metro will run from Sydney’s northwest via then enter the city via a north-south corridor with four CBD stations (two of them interchanges with the existing network). It will then run southwest from the city to join the Bankstown line. While the metro will expand the rail catchment in the northwest and within the CBD at Barangaroo, the spacing of stations and their location (often near existing stations) means that additional coverage within the inner suburbs will be limited. Similarly the second metro line currently being planned to run from Westmead and Parramatta to the city is likely to add no more than a couple of stations in the inner west, even though a portion of the proposed corridor runs close to Bradfield’s planned line. If Bradfield’s inner-city lines had been constructed Sydney would have had around 25 additional stations within eight kilometres of the CBD, nearly double the number today (not counting the City Circle stations). This would have contributed to a much more even spread of rail access around the inner suburbs. With Bradfield’s planned service frequencies of 15 to 40 trains per hour these areas would have been provided with a true mass transit system, linked not only to the CBD but also to each other. The inner west and eastern suburbs loops in particular would have provided multiple pathways into the city, though this approach exposed a flaw in Bradfield’s early design. These loops would have fed directly into the City Circle, providing very high frequencies and fully utilising the capacity of the line, but leaving the whole system vulnerable to a breakdown, particularly on the Circle itself. Bradfield recognised this and in his 1925 plan separated the lines operationally from the City Circle. 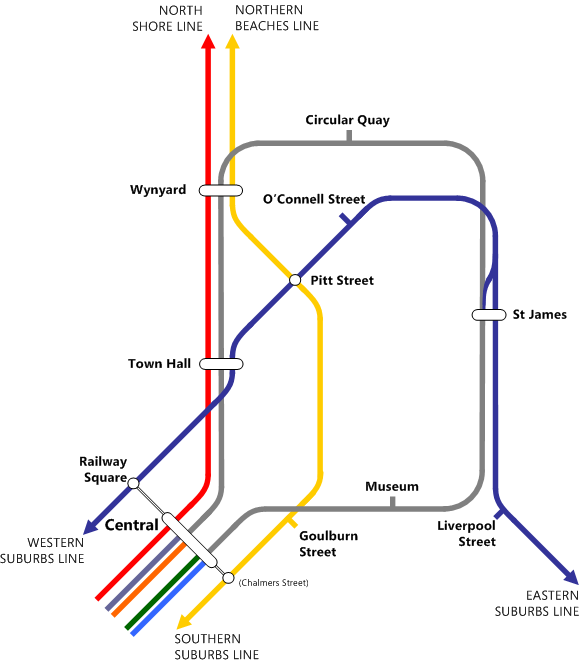 The 1925 iteration also proposed that the Northern Beaches and Manly line connect through Wynyard then run south through the CBD again on a separate alignment, with a station and interchange to the proposed east-west corridor. 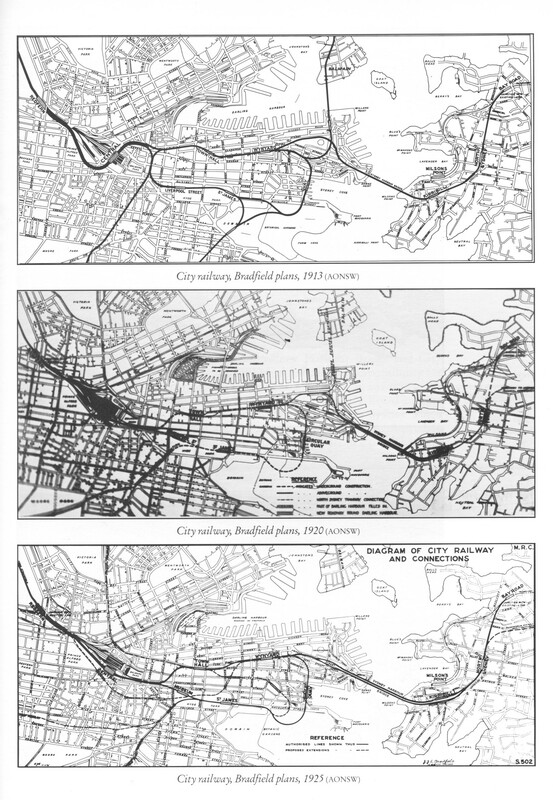 Sydney would have looked very different if these projects had been constructed. Densities in inner suburban areas would have increased as Bradfield intended but probably relatively gradually and evenly. The demise of the tram system would probably still have occurred but with Bradfield’s lines in place arguably there would have been a greater justification for the decision. Similarly, the explosion in private vehicle ownership would still have taken place, but in these inner suburbs there would have been much less incentive to use cars. Bradfield’s plan provided such an increase in capacity to the main line suburban railway in the inner areas that the NSW Government and rail planners were able to benefit from this capacity with incremental outer area extensions to the main line for around 80 years before the system showed significant signs of stress. It provided opportunities in the 1930s for the type of through CBD capacity that Paris introduced in the 1970s and CrossRail and Thameslink in London are introducing this decade. The metros currently being constructed and planned will also provide substantial additional rail capacity through the CBD but are very different in scope and scale to Bradfield’s proposals. Again, the primary focus is on their ability to increase rail access in the middle and outer suburbs. This focus is understandable – after all, the area west of Parramatta which had a population of only 52,000 in 1921 now has 1.5 million residents and has also suffered from under-investment in rail infrastructure. However, apart from the ESR and the Airport Link, and even with the small number of additional stations planned for the metro, Sydney’s eastern and inner western suburbs will continue to rely on congestion-affected buses and increasingly crowded light rail – ironically part of the impetus for Bradfield’s plans a century ago. As densities and traffic increase, aspects of Bradfield’s inner-city rapid transit plans may yet need to be revisited. This article is based on Bradfield’s 1924 thesis The City and Suburban Electric railways and the Sydney Harbour Bridge and his 1916 Report on the proposed electric railways for the City of Sydney, along with other historical material. It also draws on Richard Raxworthy’s 1989 biography of Bradfield The Unreasonable Man as well as Gary McGregor and Bob Hammer, “100 years of metropolitan rail strategy in Sydney lessons for the 21st century” in: CORE 2016: Maintaining the Momentum. Melbourne: Railway Technical Society of Australasia, 2016: 440-455. This entry was posted in Bradfield, Public Transport, Sydney metro area, Transport and tagged Bradfield, Infrastructure, metro, State Government, Sydney metro area, Transport. Bookmark the permalink.